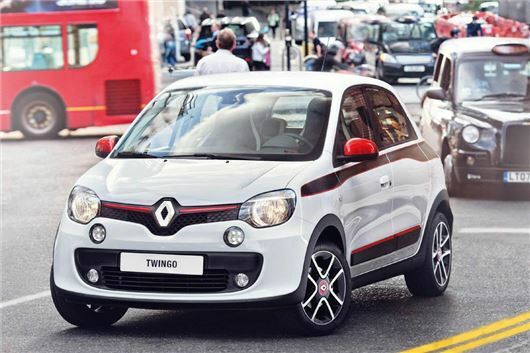 The much anticipated Renault Twingo will cost less than £9500 when it goes on sale in late September. The all-new hatchback is unconventional with a rear-engined layout designed to maximise space and manouevrability. The entry-level Expression model is priced at £9495 and is powered by a 1.0-litre three-cylinder SCe engine with 70PS. There are three trim levels - Expression, Play and Dynamique, with the latter available with a more powerful 0.9-litre turbocharged TCe engine with 90PS. Dynamique models also get an engine start/stop system to improve fuel economy. All models come with LED daytime running lights, power steering, electric windows, remote central locking, a trip computer plus body-coloured bumpers, door handles and mirrors along with a rear spoiler. There's no Euro NCAP rating yet but the Twingo does have stability control, hill start assist and four airbags as standard along with a tyre pressure monitoring system. The Play version comes with air conditioning, a height-adjustable driver’s seat and steering wheel, plus 15-inch black two-tone wheel trims in place of the grey ones with Expression. Dynamique adds 15-inch alloy wheels, pinstripe shoulder-line decals, front foglamps, electric heated door mirrors, cruise control, a lane departure warning system, a leather-trimmed steering wheel and gear lever, white instrument backlighting, a folding key and storage pockets in the rear doors. There will also be a wide range of personalisation options including an interior style pack which adds a choice of colours for the uphostery and door cards plus an exterior touch pack which gives different colours on the grille, side rubbing strips and door mirrors. The top Dynamique model is available with an optional Sport Pack which comes with 16-inch 'diamond-cut' alloy wheels, part-leather red and black upholstery, side decals, aluminium pedals, the red interior touch pack – which adds colour to the steering wheel, centre console and airvents – and the exterior touch pack. Nice to see a standard wheel size across the range, none of the usual nonsense about a trade-off between a comfortable ride and creature comforts. Hopefully the pictured ones are the 16" from the sport pack as they're worryingly thin if they're the standard 15"